The nation is celebrating another birthday even as Americans are embroiled in a heated debate over who should be able to become a bona fide resident of the Land of the Free and the Home of the Brave. Of the estimated 11.5 million undocumented residents of the U.S., only about half would be expected to become permanent legal residents if the current immigration reform bill becomes law according to the best expert estimates and historical comparisons. And of that number, an even smaller percentage would be expected to pursue full citizenship. 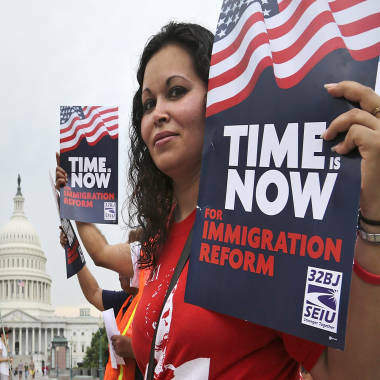 The battle over comprehensive immigration reform most heatedly centers around the question of whether those present in the United States illegally should ever have a pathway to American citizenship. Proponents of the reform bill passed by the U.S. Senate last week say that anything short of the possibility of citizenship would create a permanent underclass of individuals whose only crime was committed when they first entered the country; opponents say such a measure amounts to “amnesty.” Skeptical Republicans also say that a “pathway to citizenship” merely creates legions of new Democratic voters. Activists for immigration reform march on Capitol Hill in Washington on June 26. But somewhat glossed over in the debate is the question of just how many undocumented immigrants would actually take the steps required to become United States citizens – with the right to vote and run for federal office. It’s impossible to come up with an estimate that’s exact, but there are some clues in history, in polls and in analyses of the Senate legislation that help inform the guessing. One first clue is the 1986 law that created a path to citizenship for immigrants in the country illegally. That bill, now derided as deeply flawed by both friends and foes of the current reform bill, resulted in the granting of green cards to about 2.7 million immigrants. In 2010, a Department of Homeland Security survey found that just 40 percent of those 2.7 million had become American citizens. Okay, but what about the bill that just passed the Senate – almost 30 years later, when many in the undocumented population have much deeper roots in their communities? Yahoo News' Jeff Greenfield and the Washington Post's Eugene Robinson join Morning Joe to discuss the fate of immigration reform in D.C., and why the House GOP wouldn't necessarily be doomed if it voted against the bill, as many expect them to do. The universe of undocumented immigrants in the United States is probably somewhere between about 11 and 12 million; the Congressional Budget Office uses an estimate of about 11.5 million; in 2011, the Pew Hispanic Center pegged the number at about 11.1 million at the end of 2011. But, under the Senate law, undocumented immigrants wouldn’t automatically get that legal status the day the president signed the legislation. They’d have to apply for it through the Department of Homeland Security – a process which includes the payment of $1,000 in fines. So how many of those 11 million or so individuals – in the country illegally either by unauthorized entry or visa overstay – would actually apply for legal status? In its report on the Senate bill, CBO estimated that about 8 million undocumented residents would gain legal status under the bill. That’s based on the belief that 6.8 million people would initially register for RPI status, although a number of them would not meet the requirements. An additional 1 million undocumented residents would register as temporary agricultural workers, CBO estimates, with another half million spouses and dependents of those individuals also eligible to apply for the agricultural “blue card” program. After 10 years, individuals with RPI status would be available to apply for “Legal permanent resident” (LPR) status --- a green card. The “blue card” agricultural workers and their families - as well as RPI status individuals who were brought to the US as children -- are eligible to apply for green cards on a slightly faster track – if they pay fines and complete work requirements. So, by 2023, CBO estimates, about 1.4 million “blue card” workers would have adjusted to green card status, along with an additional 400,000 previously undocumented individuals who were brought to the country as children. Between 2025-2028, when the first round of “RPI” status residents are eligible to move up to legal permanent resident status, another 3.9 million would get their green cards. That adds up to somewhere in the neighborhood of 5.7 million new green card holders who were previously undocumented immigrants. But while green card holders may be as patriotic as the next legal inhabitant of the U.S., they don’t have all the trappings of a card-carrying citizen. A green card holder can work wherever they choose (with the exception of some government jobs) and generally travel freely, but they cannot vote, serve on a jury, travel with a U.S. passport, or run for federal office. Citizens also do not risk deportation if they are convicted of a crime, unlike green card holders. So what percentage of those who are ELIGIBLE for citizenship will actually apply? Mark Hugo Lopez, the director of research for the Pew Hispanic Center, says the answer may lie somewhere between public polling and the historical record. According to a poll by the Center in 2012, nine-in-ten Hispanic immigrants who are not citizens (including those in the country illegally) say they want to become citizens. But, Lopez notes, the reality is far from that, particularly for Hispanic immigrants who struggle with the cost or language requirements. “Even though many people desire to become a U.S. citizen, barriers such as leaning to speak English and also the financial cost of even applying for citizenship are barriers that many point to for why they have not yet applied for citizenship even though they are in the United States legally,” he said. The numbers of naturalization are lower for Hispanic immigrants than for others, and particularly low for Mexican immigrants who are eligible to become citizens. Only 46 percent of Hispanic immigrants who are eligible to become citizens have applied, compared to 71 percent of non-Hispanic immigrants, Pew calculates. Just 36 percent of eligible Mexican immigrants have naturalized. But it’s fair to say that cries of “11 million new voters!” are overwrought – or at least a few decades early.